I’m breaking into a new topic with y’all today with this post! I don’t post a ton of things beauty related because, in all honestly, that’s not my forte. I don’t wear a ton of makeup and I’m certainly not super knowledge about it. However, one thing I do know about are brows. Since I started filling in my brows a few years ago, I have tried out many products and found some that I really like! Today, I’m reviewing four eyebrow products that I have in my make up bag and exactly what I use each of them for. I tried each product on one eyebrow so you can see how it really compares. First up is the Benefit Goof Proof Brow Pencil. The name is very true to the the pencil. It is super easy to use and glides on very well. It’s great for filling in patchy spots and shaping your brows. I love how it has the brush on one side and the pencil on the other. It’s a smooth application and easy to color match. This is the one I reach for on a daily basis for work. I wear color 2 and this is $24. Next is Elizabeth Mott Queen of the Fill. I really love the brush on this one and it makes it the easiest to apply. This is definitely my go to when I’m in a rush. Because the brush is a little bigger, shaping with this one isn’t the easiest, but it fills in color beautifully! I am wearing color light medium and this product is $20, unless you subscribe to their program. You can get a new tube every 30 or 60 days for just $15. I got the Tarte Colored Clay Tinted Brow Gel during their HUGE sale this summer. The only color this is available in is a grey, so if you have super dark brows, this probably won’t work for you. I kind of like the way the grey looks on me, but the brush is so, so tiny that I just don’t love this product. The consistency is nice and it dries super quickly, but it’s kind of tedious to apply. This is the grey shade and it is currently on sale for $12, which is a steal! The last product is actually the one I’ve had the longest. The Anatasia DipBrow Pomade comes in a tiny little jar, but this stuff lasts forever. 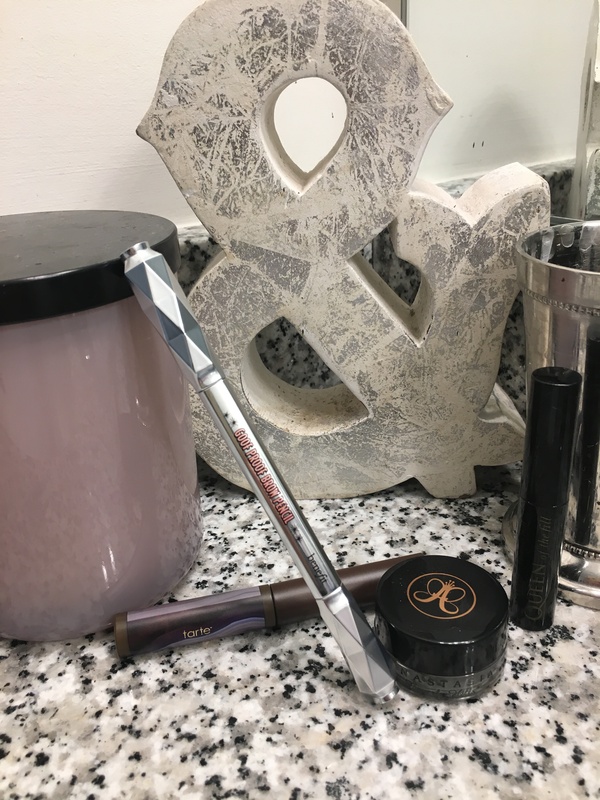 You have to have a brush to apply it, but this can give you a very natural look or you can use it to completely reshape and style your brows. The color I have is a little too dark for me, especially during the summer, so I haven’t used it much lately. I love this stuff for taking photos or for an event that I need my makeup to last for. I’m wearing color Chocolate (I will probably try soft brown next time) and this is $18. I hope y’all enjoy a little beauty element thrown in once in a while. Which brow look is your favorite?